Arkady Plastov is a fairly well-known Russian landscape painter of the middle of the last century. His paintings are lively and bright, saturated with light and green. The paints used by the artist shimmer and play on the canvas, giving the picture warmth and some melancholy inspired by the landscape. “Youth” is the song of life itself, which the artist managed to convey in colors in a way that no one else could. The canvas literally shouts to its viewers their love for life, nature, existence itself. 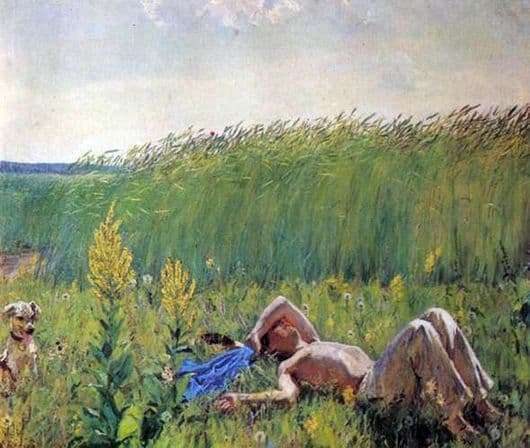 This is manifested primarily in the flowering and verdant summer meadow, in the grass oscillating under the gusts of a light warm wind, and in the youth who decided to rest after a long working morning. The young man lies half-naked, shirtless, giving his young body to the rays of the hot midday sun, from which he reluctantly hides behind his hand. This position of a young man speaks of his carelessness, which, unfortunately, is characteristic only of his youth. So, having rested, he will start working again, but now he wants only one thing – he will soak up in the warm sunshine and perhaps take a nap. His young strength, at the time of which he had barely entered, is emphasized by spiked fields, filled with bread and life-giving grace. The guy’s dream is guarded by a faithful dog, sticking his tongue out, he intensely watches the man lying, ready to jump on the first sign and continue on his way. The dog does not dare to show his impatience, although, apparently, she really does not want to sit in one place, she is also young, as her owner, because she is full of energy, as can be seen from pointed, slightly bent ears, and curious sparkling eyes. The time around stopped and stopped to give both nature and one of her greatest creations to enjoy the moment of her youth, which can only be repeated by the artist’s brush.